My husband actually kicked me out of the house yesterday and told me to go to the barn. I spent Saturday snowed in and painting, and by Sunday, I was in full-on cabin fever mode. He knew just what I needed, though, (or he just wanted to get rid of me for a few hours). He saw the farm's dog digging in a snowpile. 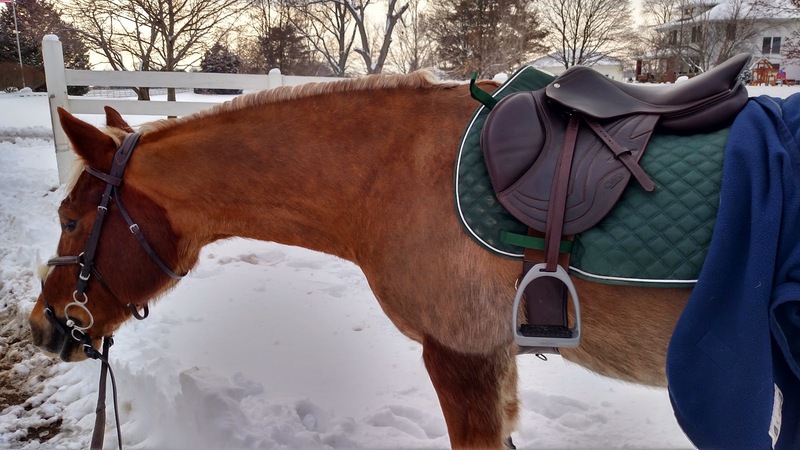 Ignore the loop in the bridle, sometimes you just have to admit that keepers and winter gloves just do not mix. 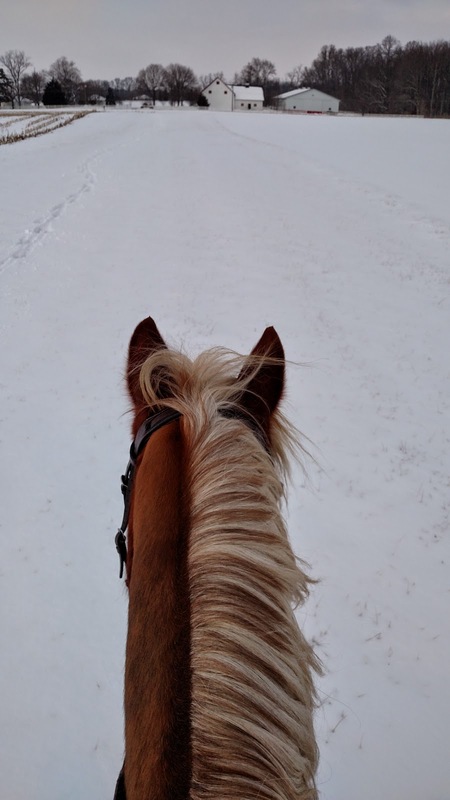 I started out hacking him down the track, but then the herd in the big field across the road saw him, no doubt because he was obvious against the snow, and stood at alert and ran. This turned my quiet ride into a prancy, alert ride, and I decided to head to the indoor and get some real work done. 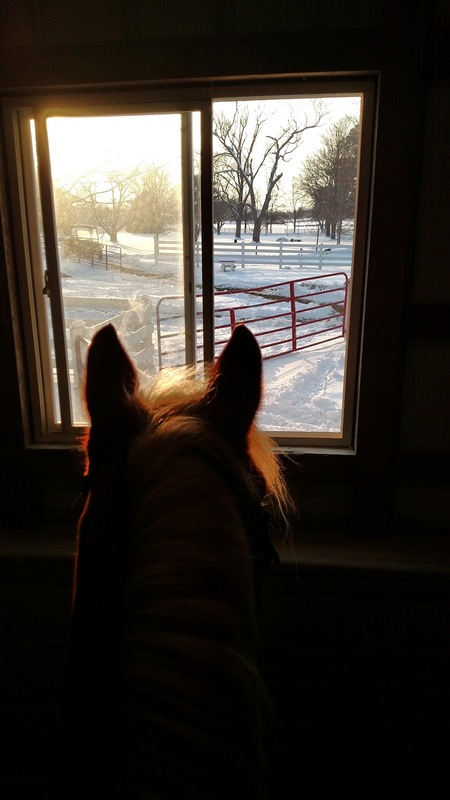 The indoor wasn't much better, since it feels like it's been months since we rode in daylight, and the late afternoon sun was causing shadows and sunbeams. But we did get some work in, a lot of cantering. I asked for different gears in the canter like we did at the trot. 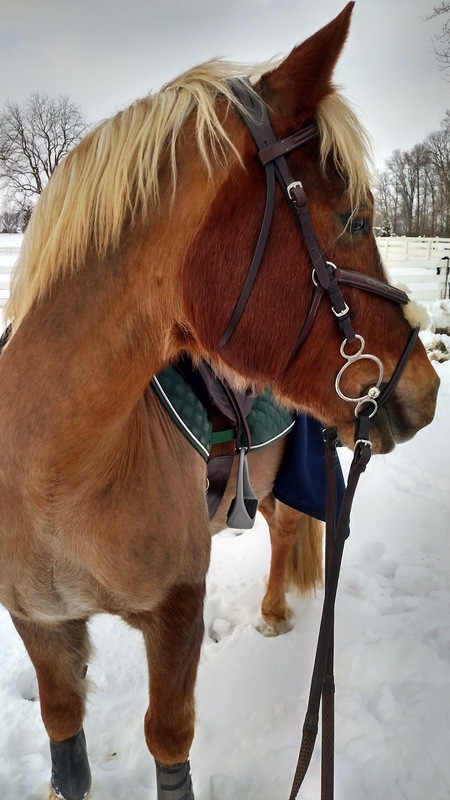 I also moved him back and forth laterally while cantering. He's always been weirdly good at that, for a horse that once couldn't canter and also doesn't always remember how to leg yield at the trot. Now he gets a week off, because I fly to Texas on Tuesday to first visit my best friend in Houston, then for Blogger Weekend, courtesy of my husband having more airline miles than he knows what to do with thanks to work. 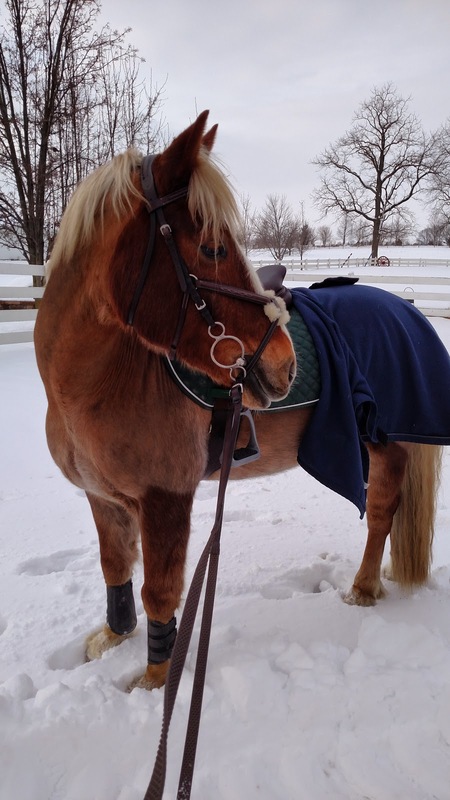 I fully intend to bring Spring back with me when I get home on Sunday, so he better be ready! It's time to go to work! Winter is only good for gorgeous sunsets. Yeah I pretty much give up on that and cleaning tack at the barn in the winter. Have fun on your trip!!!! Yep, mine needs his alone time too! It was actually the nicest riding day of the week at 22 for a high. I'm just bummed because so far our weather is looking YUCK for this weekend! I know. :( Once again I go to Texas for the second time in two months, and it's cold and wet while I'm there and gorgeous the day I fly back! We hit 30 degrees Sat & Sun! It was amazing :) Have a wonderful time in TX and soak up all the sun and warmth! Haha, my husband did the same thing to me! I am truly amused by how often that happened.